Its Monday and I knew I missed two food memes in row. And so I am making up for this one. 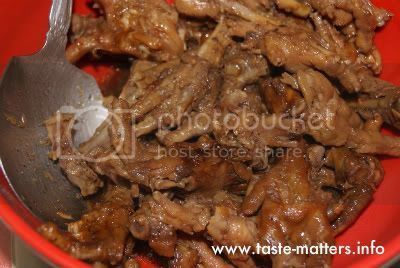 My entry for this week is my favorite chicken feet adobo. I started eating chicken feet from the chinese food. Then my mom cooked chicken feet adobo, the rest is history. I seldom eat this as hubby doesn't buy this in the market. But when I can come along, he simply cannot stop me. When I am stress and want to splurge myself with food, I better eat this than lechon. Whatchasay? Have you tried this? Masarap eto.. try mo! ako na fave Tin, pero ako ra pod ang mukaon sa family...ako 2 boys di mukaon ani hahahaha.